Virgin Media and Spotify are rumoured to be close to signing a deal that would offer Virgin Media customers access to Spotify's subscription-based music streaming service via their televisions. Virgin originally had plans to develop its own music-streaming service, announced back in June 2009 following an agreement with Universal Music, but has seemingly been forced to shelve those plans when negotiations with the other major record labels stalled. Sony Music was the label causing the most problems during the negotiation process, according to music industry execs. One senior music exec told The Telegraph this week: "Virgin Media has built its own service and it's really good. But it has yet to sign up any of the other major three record labels, so it can't launch for at least 12 to 18 months. "Warner and EMI are driving a tough deal, but Sony US management has really stuck its heels in and is not budging. The company do not like the idea of offering unlimited amounts of downloads for a monthly subscription fee." Spotify and Virgin have both so far declined to comment on the existence of such a deal. "Virgin Media is forging new ground in music and whilst we are currently in talks with numerous parties, we want to ensure that any service provides a truly compelling offering for both consumers and industry," was the statement issued by Virgin today. For its part, a Spotify rep fed us their own PR line, informing us that the company was in talks with "a range of internet service providers" but could not say more about any specific deal on the table with Virgin Media. While we await official confirmation from either company, a number of leading experts and authorities in the digital music field gave us their own opinions on what such a deal might mean. "If it goes ahead then this deal represents further validation that the likes of Spotify - coming out of the start-up and tech sector rather than the established industry - continue to provide the most innovative and compelling experiences for music fans," said Albin Serviant, CEO of MXP4. "We'll hopefully see lot more partnerships and consolidation in this manner in the future, as it best serves the consumer in the end." "Piggybacking an existing service such as Spotify is far less ambitious a step compared to its original plans of launching its own unlimited MP3 download service. But this is clearly much more achievable in terms of being able to get the necessary label licences which Virgin failed to secure for its unlimited download model and consequently also a far less costly option. "Music Ally has long advocated the idea of ISP-based music services which consistently appeal well in consumer research groups to music fans. 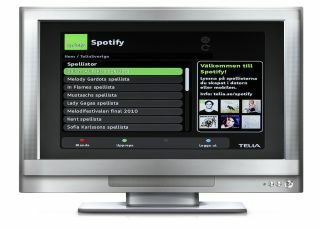 Other ISP music services such as TDC's Play service in Denmark, have been successful in both acquiring and retaining new customers. "So we presume that this is what Virgin would hope to achieve with its purported deal with Spotify where the service could be bundled in with its other TV, broadband, and phone offerings"
TechRadar has contacted Sony Music, Warner Music, EMI and Universal. None have so far been available to comment on the rumoured deal between Virgin Media and Spotify. Another unnamed source told The Telegraph this week: "Spotify and Virgin Media are close to concluding a partnership deal. The finer details are not yet known, but Spotify will be offering new tools and content exclusively to Virgin customers as part of the arrangement." Virgin Media's competitor Sky already has its own music streaming offering, called Sky Songs, which lets subscribers play or 'stream' music online, as well as download albums and individual songs at great value prices. Subscriptions for Sky Songs start at £4.99 per month for unlimited streaming of over 5 million tracks plus 5 track downloads per month. Expect more concrete details on the rumoured deal between Spotify and Virgin Media as soon as we get them.